Qualcomm Inc. on Monday introduced its next-generation mobile processors, the Snapdragon 810 and 808, for smartphones, tablets and other mobile devices. The San Diego company is the leading producer of processors for high-end mobile devices, holding a lead similar to that of Intel Corp. in desktop and laptop computers. Among the devices using Snapdragon processors are the Kindle Fire HDX, Google Nexus 7, Samsung Galaxy series and Motorola Droid series. The company said the new Snapdragon 810 and 808 processors are its highest performing chips to date, and will be available in small quantities in the second half of 2014 and in commercial devices by the first half of 2015. 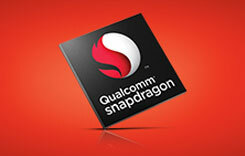 “The announcement of the Snapdragon 810 and 808 processors underscore Qualcomm Technologies’ continued commitment to technology leadership and a time-to-market advantage for our customers for premium tier 64-bit LTE-enabled smartphones and tablets,” said Murthy Renduchintala, executive vice president of Qualcomm Technologies Inc., the subsidiary that produces the Snapdragon.